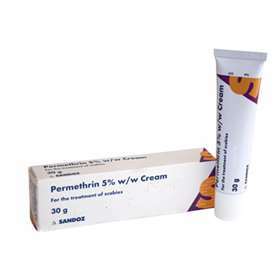 Permethrin 5% w/w Cream - For the treatment of scabies. Cream for topical application to the skin. Up to one tube (30g). Up to half a tube (15g). Up to a quarter of a tube (7.5g). Up to an eighth of a tube (3.75g). Apply over whole body except face and head in adults and children over 2 years. In the elderly and children between 2 months and 2 years, apply over whole body including face and head. Wash off thoroughly 8-12 hours later. Repeat once if necessary after 7 days. Children under 2 years should only be treated under the supervision of a doctor. PERMETHRIN, CETYLSTEARYL ALCOHOL, PARAFFIN HARD, CETOMACROGOL 1000, ISOPROPYLMYRISTATE, BENZYL ALCOHOL AND PURIFIED WATER.